Support America and help restore the American economy by recycling your American dollars here in the United States by purchasing American made products. Poll: Would You Spend An Extra Dollar For An American Made Product? Can we as American consumers help create more jobs in the United States and help turn the US economy around simply by changing our shopping habits? What is your opinion on American made products? Take our poll and share your thoughts by leaving us a comment! Would You Spend An Extra Dollar For An American Made Product? Yes, I already go out of my way to buy products that are made in the USA. Maybe, but why should I? No, I prefer to buy the cheapest crap that I can find. 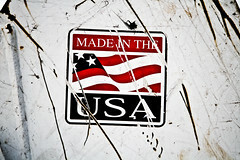 Uh, do made in the USA products really exist? A relative recently picked up a ComposTumbler from an estate sale for only $35 and then sold it to us for the same price! What a deal! I think our new ComposTumbler will be a great compliment to our other compost piles and our newly built in-ground vermicomposter. I’m excited to see if the ComposTumbler can really produce usable compost in as little as 4 to 6 weeks, and what’s even better, it’s Made in the USA! What kind of composting do you do? Leave us a comment and let us know. 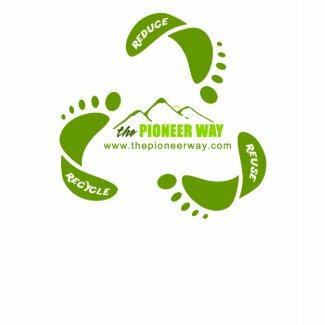 I’m excited to announce that The Pioneer Way has a new t-shirt design that focuses on recycling. The new Reduce Reuse Recycle t-shirts are available in styles for both men and women, so get yours now and help promote sustainable living! All shirts are sourced from American Apparel and are Made in the USA, and for those of you that are super environmentally focused, some of the shirts are also made from 100% organic cotton. If the Reduce Reuse Recycle shirt isn’t your cup of tea, we also have a great one of a kind original Powered by Bacon t-shirt as well as a Pioneer Way Classic design. Make sure to check them all out! What do you think about our new Reduce Reuse Recycle t-shirts? Leave us a comment and let us know how your ideas for lowering your carbon footprint! Good news, I’m close to launching another Pioneer Way original t-shirt. The new shirt will focus on recycling, and will be a great addition to both the Pioneer Way Classic, and the Powered By Bacon original t-shirts. If you have any interest in a good American Made t-shirt that conveys a positive message, make sure to check back soon! Is Your Cookware American Made? Maybe Black Friday has come and gone, but the holiday shopping season is still upon us. Are you still looking for that perfect gift for someone special? Why not help the United States economy and do your part to help keep our fellow Americans employed this holiday season by shopping for products that are made in America! 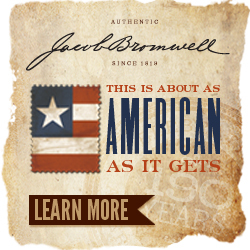 Jacob Bromwell is a great place to start! They’re an American based company that produces quality American made products and guess what, they’ve been doing so since 1819! How cool is that! Listen up all you bacon lovers, The Pioneer Way now has custom one of a kind “Powered by Bacon” t-shirts for sale. Be one of the first to show the world your true love for bacon with a Pioneer Way original t-shirt. All Pioneer Way t-shirts feature an original design printed on a cotton t-shirt that’s made in the USA by American Apparel. Pioneer Way “Classic” t-shirts are also available. What do you think about our new custom shirts? Leave us a comment and let us know!